OCEAN SPHERE Phytoplankton called Emiliania huxleyi (one shown) are covered in tiny calcium carbonate platelets. When infected with a virus, the algae lose the platelets quickly. When tiny sea algae get sick, they may sneeze the seeds of clouds. 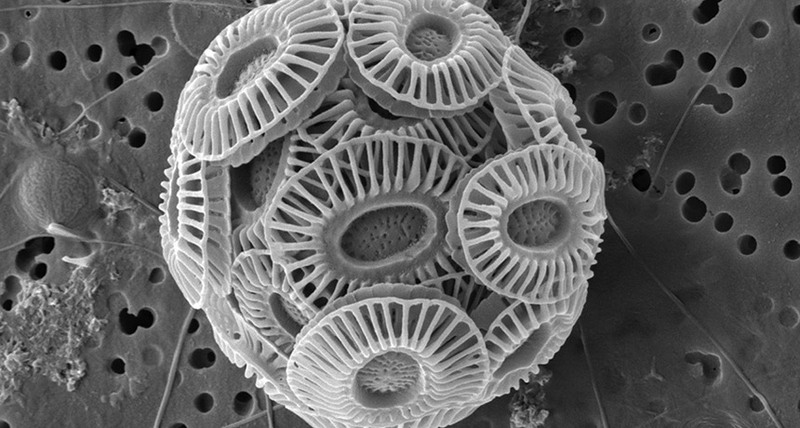 Phytoplankton (Emiliania huxleyi) infected with a virus shed the small calcium carbonate plates that make up their shells much more quickly than healthy phytoplankton. Kicked up by thrashing waves into sea spray, those calcium bits may ultimately become part of the complex dance of cloud formation, researchers report August 15 in iScience. This is the first study to suggest the role that viruses, which often infect and kill phytoplankton in the ocean (SN: 7/9/16, p. 12), may play. The finding adds to a growing body of work showing that cloud formation is regulated not just by physical processes, such as evaporation and heat exchange between ocean and atmosphere, but also by biological processes, says marine biologist Roberto Danovaro, who wasn't involved in the new research. Previous studies in the Southern Ocean have shown that the marine organisms increase the number of cloud-forming droplets lingering in the atmosphere over the ocean there by about 60 percent each year (SN Online: 7/17/15). Phytoplankton may add to cloudiness by contributing gases and particles that can become "seeds"around which water vapor in the atmosphere can condense to form clouds. In a controlled laboratory study, atmospheric chemist Miri Trainic and colleagues watched the progression of a phytoplankton viral infection and monitored how it altered the shedding of the calcium carbonate plates as well as the composition of sea spray. "We were convinced that those interactions must change what's in the seawater and what will be burst out into the air," says Trainic, of the Weizmann Institute of Science in Rehovot, Israel. The team filled a 10-liter container with four liters of seawater containing a population of E. huxleyi. Even healthy E. huxleyi shed some of the tiny plates that make up their shells, called coccoliths; during ocean blooms, those shed coccoliths appear in satellite images as vast, milky turquoise swirls. But when infected by a virus - called E. huxleyi virus - the phytoplankton tend to burst and rapidly drop all of their coccoliths, the researchers found. One day after being infected, the phytoplanktons' number of calcium carbonate cells abruptly dropped. Uninfected phytoplankton saw no change in the number of their calcified cells in that same time period. Within three days, seawater surrounding the infected phytoplankton had three times as many platelets as water around the microorganisms' healthy counterparts. To simulate sea spray, the researchers pumped air through the tank and measured the tiny particles released by breaking waves and bursting air bubbles. Using polarized light microscopy to analyze particles in the spray collected on filters, the team found that the spray above the virally infected populations contained about two particles per cubic centimeter of air. That's about an order of magnitude more of the coccolith particles than in the spray above the uninfected phytoplankton, the researchers say.